In my journey through the Master Data Management (MDM) landscape, I am currently working from a Supply Chain Management (SCM) perspective. SCM is very exciting as it connects the buy-side and the sell-side of a company. In that connection we will be able to understand some basic features of multi-domain MDM as touched in a recent post about the MDM ancestors called Customer Data Integration (CDI) and Product Information Management (PIM). The post is called CDI, PIM, MDM and Beyond. Traditional Supply Chain Management deals with what goes on from when a product is received from a supplier, or vendor if you like, to it ends up at the customer. In the distribution and retail world, the product physically usually stays the same, but from a data management perspective we struggle with having buying views and selling views on the data. In the manufacturing world, we sees the products we are going to sell transforming from raw materials over semi-finished products to finished goods. One challenge here is when companies grow through acquisitions, then a given real world product might be seen as a raw material in one plant but a finished good in another plant. Regardless of the position of our company in the ecosystem, we also have to deal with the buy side of products as machinery, spare parts, supplies and other goods, which stays in the company. SCM 2.0 is often used to describe handling the extended supply chain that is a reality for many businesses today due to business process outsourcing and other ways of collaboration within ecosystems of manufacturers, distributors, retailers, end users and service providers. 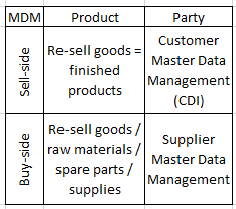 From a master data management perspective the ways of handling supplier/vendor master data and customer master data here melts into handling business-partner master data or simply party master data. For product master data there are huge opportunities in sharing most of these master data within the ecosystems. Usually you will do that in the cloud. In such environments, we have to rethink our approach to data / information governance. This challenge was, with set out in cloud computing, examined by Andrew White of Gartner (the analyst firm) in a blog post called “Thoughts on The Gathering Storm: Information Governance in the Cloud”. Thanks for adding in Ben. Indeed, you should not discuss the big supply chain without mentioning big data and the new technologies and approaches that have emerged with the raise of big data. I know you work with those scenarios at Informatica. In parallel, and in all humbleness, I work with a start-up called the product data lake, which is a solution for exchanging product information in ecosystems of manufacturers, distributors, retailers and large end users.